Hullbridge Sports knocked Stansted off top spot with a midweek win over Saffron Walden Town – which meant that Saturday’s encounter at Hargrave Park had the potential to be a title decider. A win for Hullbridge Sports would have seen them go five points clear, but Stansted were able to limit them to few clear cut chances. Hullbridge also shut out the Airportmen in a game that was a tight, tough battle. Hullbridge saw ‘keeper Lewis Greene sent off late in the first half for handling the ball outside the area, just when Callum Ibe was about to get a shot off. But in the second half Stansted were also reduced to ten men after Pappa Assamoah put in a hefty challenge. In the end the point shared from the goalless draw means that Hullbridge Sports lead the table with a two point lead over Stansted. Both teams have three games to play and if they both end the season on a losing footing then Walthamstow could be poised to make a last ditch grab for the ESL title as they are now 3rd having had a decent week that has seen them collect six points. A 5-0 win over Leyton Athletic on Wednesday when they were the visitors at Wadham Lodge; on Saturday they were the host team and goals from the ever green Dwade James alongside a Kieran Bishop goal saw them beat Takeley 3-0. James Bransgrove also made it three clean sheets in a row. It is a long shot for Stow but they are 3rd and mathematically still involved at the moment. Saffron Walden Town are 4th after a 4-3 away win over Sporting Bengal United. Steven Carvel had fired Bengal into a 2-0 lead, but Matt Frew was able to reduce arrears six minutes before the break. But early in the second period Bengal were able to re-open their two goal cushion as Curtley MacIntosh found the target. Lewis Francis pulled one back for the Bloods twelve minutes before time. And the game was turned on its head in the final ten minutes as Connor Molloy equalised in the 83rd minute and then in the 87th fired home the winner. There were a few goals in the St Margaretsbury v West Essex game; unfortuantely for the hosts six of them ended up in their net. The Stags scored first half goals from Symeon Taylor (2), Samraj Gill and Michael Mignot. Although Enzo Periera was able to score twice in the second half to reduce arrears, West Essex then sealed the deal with Mignot scoring twice in the final three minutes to secure the points and bag a hat-trick along the way. The Bloods may have to settle for finishing as high up the table as they can as landing the ESL title at this stage may be just beyond them. With it being confirmed that only the bottom top will get relegated this year suddenly hands Leyton Athletic and Barkingside a life line. It means that those two teams are now fighting it out to secure their ESL Premier Division status – which is just as well because the teams just above them both won on Saturday. Tower Hamlets went to Oakside and dished out a 4-1 beating – a score line that the Motormen have been accustomed to winning by recently. But Hamlets where three goals to the good thanks to a Luka O’Neil brace alongside a Ryan Atkinson goal before Dan Gilchrist replied for the hosts. The points were secured when Yoan Edoukou scored a further goal for Tower Hamlets just past the hour mark. The win means Tower Hamlets remain 18th, Redbridge four places higher. Southend Manor registered a 2-1 win at Hoddesdon Town. Kye Jude opened the scoring for Manor in the 50th minute but Connor Bolton equalised in the 65th minute. But Manor secured the points via a Michael Ogboin winner in the 72nd minute. With both those teams now safe means we turn our attention to the bottom two, with Leyton Athletic’s midweek 5-0 loss at the hands of Walthamstow being impacted by the 2-0 defeat they suffered at Ilford on Saturday, which now sees them drop to the foot of the table. The Foxes scored their goals via Alejandro Butler and Ryan O’Connell. 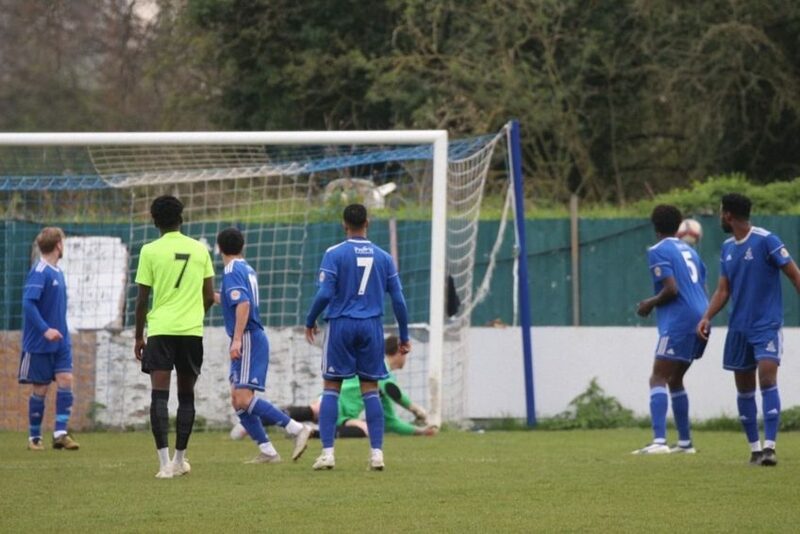 While the landlords may have done their tennants a favour, it should also be noted that Barkingside took care of their own business on Saturday as they beat Enfield 3-1. Edward Lang and Derek Ohalem had placed Side into a 2-0 lead before Jimmy Cox pulled one back for the E’s in the 67th minute. However Barkingside made sure of victory by scoring a further goal via Isaac Marfo in the 76th minute which now sees them move to 19th and therefore out of the relegation position. Side also had a game in hand, but it looks like the relegation issue will go to the wire, much like the situation up at the top. The Harlow Arena actually hosted two ESL games over the weekend as Woodford Town played their last ever game at Harlow Town before moving to their new Ashtons base from next season. Sawbridgeworth Town provided the opposition, travelling down the M11 for this ‘local’ derby. The Robins even took the lead too, with Aron Thomas supplying the goal in the 17th minute. However Asher Modeste went on to score in the 34th and 63rd minutes with Mohammed Ali then popping up ten minutes from time to secure victory for the Woods. Clapton meanwhile shared the points with Stanway Rovers after their game finished 2-2. Giovanni Palmer and Ali Al-Nashi scoring for the Tons with Tyrone Scarlet and Scott Kemp replying for Stanway.